The 52 week money challenge has gained quite a lot of popularity as a way to save money during the year, but it’s not the only way to save money. I had a good heart-to-heart talk with a woman who told me she loved the concept of the 52 week money challenge, but she simply couldn’t do it. She explained that each week when she needed to put aside the money for that week, she would panic. The first couple of months were okay because the dollar amounts were low, but as they started to increase, the weekend became a time of terror because she knew she needed to put away money that she didn’t have. She ended up giving up because the challenge was causing more stress than it was worth. She asked me if I knew of a different challenge that might be able to help her. I didn’t know of any, but the more I thought about it, it became clear what she needed. She liked the concept, but dreaded when it was time to put money away, because she didn’t have it when the week ended. What she needed was a challenge that forced her to save money before it was gone. She also needed a challenge where the amount of money she was supposed to save was small until saving became a habit. This would help so that she didn’t panic. 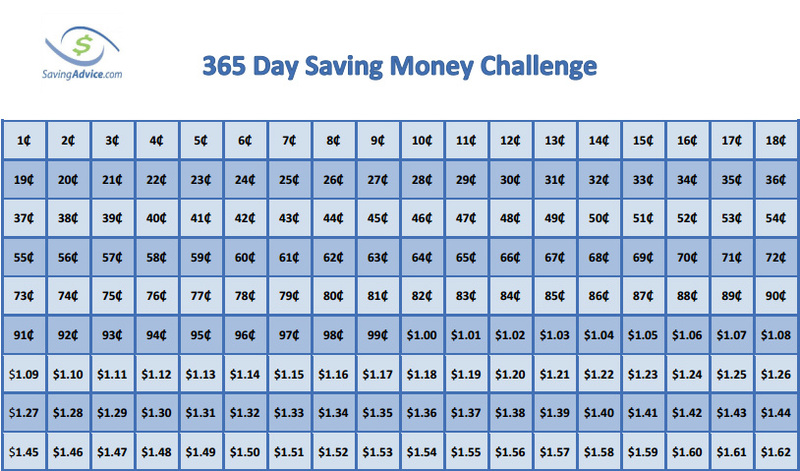 The idea I came up with was the 365 day money challenge. The concept of the challenge is simple. There are 365 days in the year. Every day before you go out, you need to pay yourself first. This is vitally important. The panic the woman had was because she didn’t have the money to save each week because she waited until the end to pay toward the challenge. What she needed to do was pay herself first. The second important point is that until paying yourself first becomes a habit, it needs to be extremely easy to do. They say it takes three weeks to form a habit, so it’s important to make saving as easy as possible for those first 21 days. Longer is even better. This is how the challenge works. Each morning when you get up, you need to pay yourself some amount before you do anything else. The payment can be anywhere between a single penny to $3.65. Once you have made that payment to yourself, you “x” out the box on your chart. Your next payment the following morning can be any of the remaining amounts on the chart. You continue to do this each and every morning for the entire year. When you are done, you will have saved $667.95. Even better, you will have formed the essential financial habit of paying yourself first which will be an asset the rest of your life. There are a couple of important steps that go along with the challenge. First, after printing out the challenge sheet, you need to place it somewhere where you’ll absolutely see it each and every morning – someplace like on the mirror in your bathroom. It needs to be visible and in your face each morning, so you’ll be less likely to forget about it. The second step is that you physically need to make the payment each and every morning. You need to go to your purse or wallet and actually place the amount you decide to pay yourself that day into a jar (or other container) specifically for this challenge. Paying yourself is just as important as any payment you make to a store, bill or service. In fact it’s the most important payment you’ll make each day because it’s for your future benefit. There are two huge advantages of this challenge over the 52 week money challenge for those who have struggled to get their finances in order. The first is that you’re starting with such small amounts that anyone, no matter what their current financial situation, can participate. If all you can do is pay the absolute minimum amount each day for the first month, you’re only out $4.65 for 30 days. There is nothing holding anyone back from trying the challenge except themselves. The second advantage is that this challenge is done on a daily basis. It requires you to think about saving every day. Even though the amount that needs to be saved isn’t much, the process of thinking about it will cross your mind each morning as you pay yourself. By the end of the year, paying yourself and saving money each day will be a natural part of your day. When you are only thinking about saving once a week, you might end up only thinking of it at the end of the week, and the entire process never gets instilled as a habit. If you have attempted the 52 week challenge and failed (or you know a friend who has), you should seriously consider trying this challenge. $668 is a good start to an emergency fund, but even more important than that, you’ll put yourself in the position to save much more money in the following years. If you do attempt this challenge, it’s still worth following the 2014 Savings Challenge and 2014 Making Money Challenge as both will give you good ideas on how you can afford to make the higher daily payments. Finally, the last few years have seen an explosion in applications designed to help people hack their savings. One great savings hack is to install digit.co. What digit does is analyze your savings account balances and then automatically makes small withdrawals which are swept into a savings account for you. It’s super easy to install. Once you have it activated, it takes pretty much no effort to save – Digit does all the work for you. Check it out at digit.co. If you enjoyed this article please share it on social media, rate it 5 stars below or leave us a comment! Nice idea. Not sure how practical the small amounts are when you end up needing to have change available every day to cover your deposits to the fund. I use a debit card so much I rarely have cash on hand. I’m glad you are able to move amounts that small. I am able to transfer small amounts of money from my checking to savings account at USAA. I guess that as long as the money stays in the accounts, they’re happy. I’ve had no problems with transferring from the first week on. I started out with just $1, then $2 and then $3….it’s slowly adding up, too. Excellent idea!! Bank of America let’s you transfer amounts from .01 on up!! Also, another alteration to this plan is pay yourself $3.65 per day and $3.66 per day on leap years along with any automatic savings plans you have coming out of your paycheck on payday. This will help pay for my trip to Japan next year. Oh, you can also do both plans to pay down debt as well. I also use my debit card all the time. I round every purchase up to the next dollar amount I also round every deposit into my checking down to the next dollar. and transfer that to my savings every month when I get my bank statement. It averages about 20 a month. Hahahahahaha — you are all suckers. All you need to do is get an extra job for a few weeks and you can make the same amount. Why waste a year saving when you could have it all before winter is over. Saving is for suckers. You need to learn how to earn more and then you don’t have to save anything because you’ll always have enough money. Hahahaha…..really? This is only a simple way start to a great habit. Unless you want to rely on living your golden years on a promised “Social Security” pension. Yea right. So while the rest of us have a goal or a plan. You can work harder and maybe have enough money to barely scrape by, when all this time you could have been saving. Who’s the sucker now. I happen to think you’re more of an idiot than a sucker. Most places its hard enough to find one job, let alone a second one. You obviously have no understanding or grasp of how bad the world economy is. You’re probably just one of those punk kids who’s mommy & daddy still pay everything for you. Even with a 2nd job you would have to save the money to always have enough money! Hahaha…saving money is for finically responsible people. Enjoy your retirement stretching every penny because you failed to see the importance of a 401k or retirement fund. Your plan may work fine for you, but your attitude toward others is really arrogant. There are people who have never been taught money management and are not aware that savings can be done in small amounts. Some people drink a $4 Starbuck’s every day, realizing that that Starbuck’s is equal to what could be their car payment for two months, or their family’s Christmas presents. Also, I hope you change your attitude and become empathetic toward others because you, yourself, may one day find yourself in need. You may lose your job, or a natural disaster may destroy your home or your business. You may become disabled in a car accident. Any number of things might change your life in a matter of seconds. Why waste time and energy in having 2 jobs when you can budget your money wisely? Especially when you have kids and family that you want to spend time with. Going to the extreme of calling people suckers is really unnecessary. Everyone’s life style and evidently mind sets are unique, therefore, people should do what works best for them. Just an FYI, you don’t have to wait an entire year. I don’t save mine daily. Sometimes I may put away the amount for 3 weeks at a time. The purpose is to save and if you want to save the amount faster, you just put more money in. Me and two co-workers are doing this plan! Thanks for posting the chart and idea! Wish us Good Luck!! Great! Wishing you great luck with it and hope to hear about your progress. Wishing you the best of luck with it. Actually, and even better, if you could deposit that change each day into a high-yield savings account (currently 0.85% annual yield) compounded daily, it would leave you with $906.50 at the end of the year; an additional $238.55 more than what you’d have sitting in a cookie jar). Actually, you are way off on that number. I’m not sure how you calculated so you could get $233.55 from an interest rate of less than 1 percent, but at 1% if the entire $668 was in the bank account from January 1st, the total would only be and extra $6.68. Still better than nothing, but not quite what you projected. petesake, actually, I am correct. If you have 1% compounded annually, then you would be right, but I said “compounded daily”. This makes a huge difference. I’d be happy to send you an excel spreadsheet that shows how this works if you’d like. petesake, I went back to check the figures on the spreadsheet. The percent function was automatically changed to a whole number, so you are correct. Sorry for the confusion. Wow, you have to love a person with a brain for numbers. I’m artistic and love to build and do things but numbers are not my friend when it comes to money. Wish I had your skills. Your awesome. Could you suggest an institution that offers rates like these without already having a large balance? My bank, and the others I have checked, are much lower than 0.85%! Discover Savings will give you almost 1% interest and requires a $500 minimum opening deposit. I know not everyone has $500 spare dollars, but all in all not too bad of a plan. You also might be able to find deals from Discover that will give you an extra $25-$100 free for opening an account. I think this is a great idea and will work differently for different people. My poor mother was very bad with money and when her dog became ill I paid the vets bill and it was not cheap. I said to her to take out insurance because I knew that she would pay that. The wretched vet dissuaded her, he said just put £5 a week away and next time the money would be there – I could have throttled him. Mum did this for about three weeks before she ‘needed’ the money which she knew was there in the drawer. The next time the dog was ill guess who paid? I did. This rambling story says that for some people the saved money has to be ‘out of sight out of mind’. This is why the idea of putting the saved amounts into a savings account is a good one! I’m going to recommend this to a relative who can’t swing the 52 week challenge and is discouraged about trying an altered version (basically, “whatever you have left up to that week’s amount”; some people don’t get past $10 or $12 per week, but it still adds up!). Great idea, I love the small amounts! My new year resolution was to start using cash instead of my debit card. To easy to swipe card and lose track of spending. When cash is gone it’s gone! I love this idea. Switching around. I agree with this plan. I looked at the original numbers and I think over $21 dollars at the end of December will be tough. I have decided to mix it up, kind of do an every other to balance it out. I am working backwards as well as forwards. One day put $.01 in the jar, the next put $3.65. ironally if you did this on a leap year, you’d have to put an extra $3.66 on the final day of the year which would mean your grand total $671.61 by the end of the year. Personally I think this challenge is better only b/c it’s more realistic and you could do it backwards and start with $3.65 on day 1, and the way by December your putting away smaller amounts so you can still do your Christmas shopping! You can also use this 52 week money challenge printable set up to do just that. it will be around $3300. WE are a family of 5 so i made a new chart to reflect this. I can email it to you if you would like. Ashley would you email it to me as well?Please! We are also a family of 5 and I would like to do it with my whole family. We are a family of 6 and I started a separate jar for each of us. The kids like putting their money in each day and if I have figured correctly it will be around 4026.00 at the end of the year. We are planning a big vacation with our jars 🙂 So far we have used loose change around the house. I did the calculations and it is going to be a bit high around Christmas. As I was reading suggestions, I like the thought of having the sheet and just marking off which one you could put in that day/week. I might try that! Thank you Jeffrey – our Middle School cheerleaders got a bid to attend competition in Orlando this year 2015 but unfortunately could not raise the money to make the trip … we are beginning this Challenge 2016 thank you for the wise advice and the chart because my Fibro Brain just could not do the math! Because so many do fail at the consistency but intentions are of the highest I am creating a FB Support Group to help keep us in tow … I hope you won’t mind. Can anyone join this support group? If so what is the name of it. Thank you for this! I just started it today and have made up for the first 4 days of the year but i’m doing it a little differently. We are a family of 5 and need to replace a vehicle so we have multiplied this by 5 and by the end of the year we’ll have over 3300 for the down payment! I encourage anyone to try this according to the number of people in your family. It was so easy to get started i had a ton of loose change in my purse. On paydays we’ll do the larger amounts and do more than one a day if we are able. We might even finish sooner! I have shared this with many people thank you! Pamela,that is the best idea yet! That’s what I like about it. Deposit whatever you have available that day, whether it’s a dime, a quarter, or a couple bucks….as long as all the boxes are checked, the money is there! I’m sure that very soon my chart will have a lot of random amounts checked and deposited which is fine by me. You don’t have to go in order. I’m too lazy. Can I just pay myself $668 and be done with it? I just started this….I also have a Lucite cube that I ONLY put silver money into, NO PENNIES. Dedicated a SEALED 3gal water jug to the 52 week challenge but also adding to it when I can. on weekends when I’m buying a snack or beer, I can easily get $10 cash back with my debit card in the form of a roll of quarters and toss that in too. Just doing THAT once a week is $520 yearly. I love this because I am a server. It is so easy to just throw my spare change and even on the 3 dollar days it is nothing. Don’t forget it’s a leap year in 2016 so you’ll save an extra £3.66p! Good eh and yes I’ve just put my 11p in my gallon demi-John. I too decided to try this challenge. However, I am doing it in reverse. I think best to start with the higher amounts now, as I hibernate a bit in winter, and like the idea of the challenge getting easier. I also intend to transfer from bank into savings account, so as the cash is not lying around. The interest element will also be better in doing it this way round too. Heres to an easy Christmas 2016. This is a great way to build an emergency fund. It gets you in the mode to save money, while attempting to reach a financial goal. It’s so easy to spend loose change, but that change can really add up as your 365 day money challenge shows. Ican totally afford to do this one. That’ll be awesome to go on like a rreally great mini vacation with the kiddos. Thanks forthis. the story. It’s surprising you aren’t more popular given that you most certainly possess the gift. My son is doing this and we have discovered that days 1-61 fit into a tootsie roll bank. While it’s all my money that is going into the banks, I’m teaching him responsibility by teaching him to save money. So on January 3, 2017 when the banks open again, I’m taking him to change it and he gets to watch how much he’s saved all year. At least half of it will be going into a bank account for him so that it will grow every year until he’s in high school. I’ll be doing it for him and his new sibling when the sibling is born in September. I bartend so change is never an issue. I did like someone above suggesting start with the higher amount and go lower. However this is my 1st time trying this! So far? Super pleased with the idea, as paying myself every day first makes it easier to remember! I am currently doing the 52 week challenge and I was worried about the large amounts due in December so I re worked the chart. I doubled the amounts every week. When I get to June ($52) I’ll turn it around and work back down. I’ll only be paying $20 in the month of December. The chart doesn’t print out properly no matter how you set up your printer. The edges are chopped off. I realize this might be asking too much, but really this is just pocket change and won’t lead to long-term success. The key to saving a lot of money is two things. First of all, automatic deposits from your income is essential. 401ks help out with this a lot. Straight out of college my future wife and I are putting 8% of our incomes into 401k, which our company matches. With matching, we will be investing 12% of our incomes into funds that have historically returned 8%+ per year. At this rate, we will retire in 43 years with $3.4 million. How are we going to do it? Simple! We are buying a duplex that is about 1/4 the price what we can afford (and hopefully getting some friends as tenants) living a relatively cheap lifestyle free of alcohol and tobacco, and probably seeking alternate sources of income. Honestly, I bet we could further invest like 20% more of our modest income based on this lifestyle and we will definitely be seeking other investment vehicles in the near future. If my lifestyle seems a little extreme to you, here’s what I recommend. Find a hobby that you can make money off of and pursue it as a family. Maybe establish a blog (about a specific topic you are interested in) and put ads/affiliate offers on it. Maybe make a garden in your backyard and farm it for a little extra cash. Maybe try driving Uber once a week or even once a month. Maybe make a book or devotional. Maybe make a cute video series about your family or pets on Youtube and get money with ads from that. There are a lot of little things you can do to build a little side-investment and all of that can go a long way. to feel a comfortable satisfying sensation educated! Just started this, as a single retiree, & w/the economy as it is, it has been very difficult to pay myself, but I can do this. I am in the 5th day of this & I actually save all my change & am using that as my beginning. It is a habit/behavior worth trying @ least. We started saving by putting away every coin now I put whatever change I get from the cash in my wallet. We basically have two separate piggy bank savings. One for one to 20 cents coins and the other for 1 and 2€ coins to 5 to 20€ notes. I actually panic when I forget to put away something and make an effort to double whatever I had planned to put away!